Are you considering putting your home up for sale? Before you do, be sure to ask yourself these three questions. 1. Is now a good time? Talk with Cathy W who knows your specific market and can analyze the current sales inventory and trends. 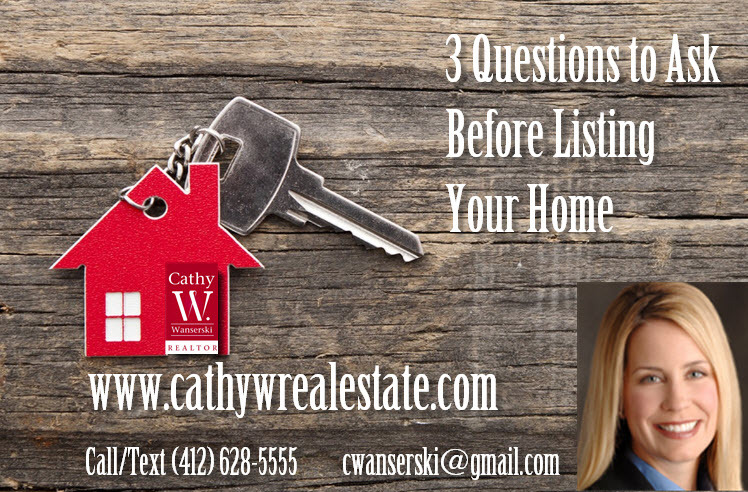 Cathy W can determine whether it is a prime time to sell your home to get the best price. There may be all kinds of reasons to wait a season to sell, such as a glut of homes on the market similar to yours. Setting the right price and understanding how that price was calculated is critical to getting top dollar for your home. Cathy W is experienced and can provide comparable sales in your area, and evaluate the specific features of your home to set a price that will bring you the most value for your house in the shortest time. 3. What's my exit strategy? You never know how quickly your home will sell, so establish a plan in case it happens quickly. Before you list it, know where you'll go if a buyer swoops in immediately, whether it's temporary housing, your brother's basement or your next home. Having a post-sale plan takes some of the anxiety out of selling your home. The most important step in the selling process? Working with an experienced individual Cathy W will provide unmatched service throughout the sales process.